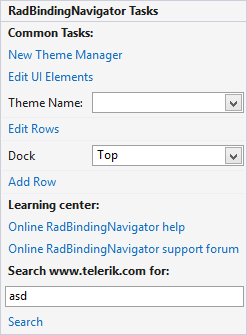 The Smart Tag for RadBindingNavigator lets you quickly access common tasks involved with and customizing appearance or setting the theme. Figure 1: The RadBindingNavigator Smart Tag. Edit Rows: This link opens a dialog which allows you to edit the currently added CommandBarRowElement properties. Dock: Allows you to select the dock state. AddRow: Use this to add new rows to the command bar.